Remember in 2010 when Apple held an iPhone 4 Press Conference as an answer to the “Antennagate” hubbub? 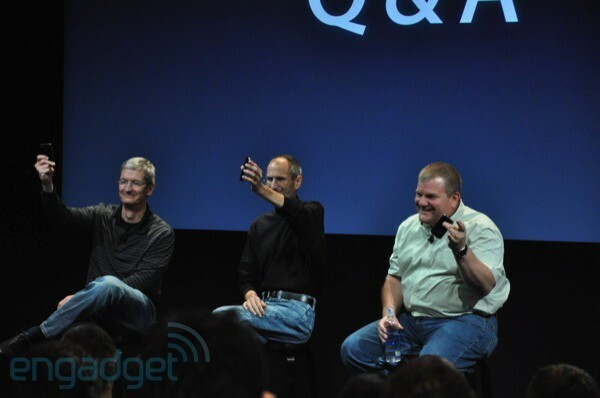 After his presentation, Steve Jobs was joined by Tim Cook and Bob Mansfield. They all sat on barstools at the front of the room and had a Q&A with the press in attendance. John Gruber asked if any of them were using cases on their iPhones. All 3 of them held up their iPhones to show no case. Steve even demonstrated how he uses his phone (by holding it using the infamous “death grip”) and that he has no reception issues. What these guys also showed was that they’re using the same phones we are. Three of the top leaders at Apple sitting in a room full of writers and broadcasters, and everyone’s got the same phone in their pockets. We like to think that Cook, Mansfield, Ive, Schiller, Forstall, and the rest of the gang are walking around with private versions of the 2014 iPhone and its corresponding (though surely buggy as all get out) version of iOS 8. Everyone knows Apple is an extremely organized and forward thinking company that puts a lot of thought and energy into the planning and testing of its future products. But Apple is also riding on the cusp of its production and engineering capabilities. After Apple announces and demoes the latest iOS at a WWDC event, most developers wait for the first few rounds of updates to ship before installing the iOS beta on their main devices. And it’s far more likely that the hardware prototypes for the next iPhones are locked away in some design vault, and the software roadmap for the far-future versions of iOS is still mostly on the white board. Meanwhile the folks at Apple are using the same daily driver iPhone and the same operating system you and I are. The browser tabs you have open on all your devices are now shared via iCloud. Had a website open on your Mac but then had to jet out the door, no problem. You can open it right back up from your iPhone or iPad. If your Mac is running Mountain Lion, click the cloud icon in Safari and you’ll see the list of tabs open on your iPhone and iPad. And from your iPhone or iPad, tap the bookmarks icon in Mobile Safari and the drill down into the iCloud Tabs bookmarks folder. Another one of those features that is so simple and obvious, and yet has a significant impact on the day-to-day usability of our phones. You can activate Do Not Disturb mode from the Settings app. To fine tune your Do Not Disturb schedule, and who you’re willing to allow to get through, drill down through the Settings App → Notifications → Do Not Disturb. This has become my main “show off” feature. When a friend asks me what’s cool about the new iPhone software I ask them to call me. Then I demo the slide-up menu for incoming calls and watch as they “get it” instantly. We’ve all been in that situation — whether it be a board meeting, dinner, a movie, or whatever — where we have to decline an incoming call from a friend or colleague. This is a feature that makes perfect sense and makes you scratch your head a bit about why it took so long to get here. We were all doing it out of habit anyway. Now it actually accomplishes something. I have worked in places were emails are sent like text messages. I often would get an email asking for me to come to a spontaneous meeting that was starting in 5 minutes. Or how many times do you watch for that email from your boss or assistant or whomever? There are whole conferences centered around the idea of how checking your email every 5 minutes is a massive productivity killer (and it’s true). But that doesn’t mean the fact remains: a lot of workflows and company cultures are still very much dependent upon people being near-instantly-reachable by email. VIP emails — and, more specifically, the way iOS (and OS X) are helping us to set them apart — are a great example of how iOS is becoming increasingly usable in real life. After 4 years worth of App Store, some Home screens (including the one on the iPhone that’s sitting here on my desk) are getting unwieldy. There are apps I know I have, but I don’t know where they are. For those I have no choice but to use Spotlight to get to them, but say I want to move them to a more prominent spot? Now when you use Spotlight to launch an app, if it’s in a folder Spotlight will tell you the name of that folder. This is one more (of what feels like a) bandaid fix towards a better way to launch and mange apps. Siri is becoming the way of “ubiquitous capture” on the iPhone. It’s the quick-entry popup of OmniFocus on the Mac. Assuming Siri can connect to the servers, she is the fastest way to get sports scores, directions, set a timer, log a reminder, and now launch an app that’s not on your first Home screen. The mobile phone industry has is no shortage of impressive, whizbang features which sound great and make fun ads but which rarely get used by real people in their day-to-day lives. The niceties shipping as part if iOS 6 are great because they’re the sorts of little things that will play big, unsung roles in our everyday lives.